Sometime last spring, I lost my cooking mojo. In the weeks and months after launching my blog, I spent hours happily looking for new recipes, making frequent grocery store trips, and whipping up new recipe after new recipe. Eventually I burned out, as evidenced by my lack of food posts for months. Yet I did not forget my commitment to cooking every recipe from Ellie Krieger’s Comfort Food Fix cookbook, nor did I stop cooking full-stop. 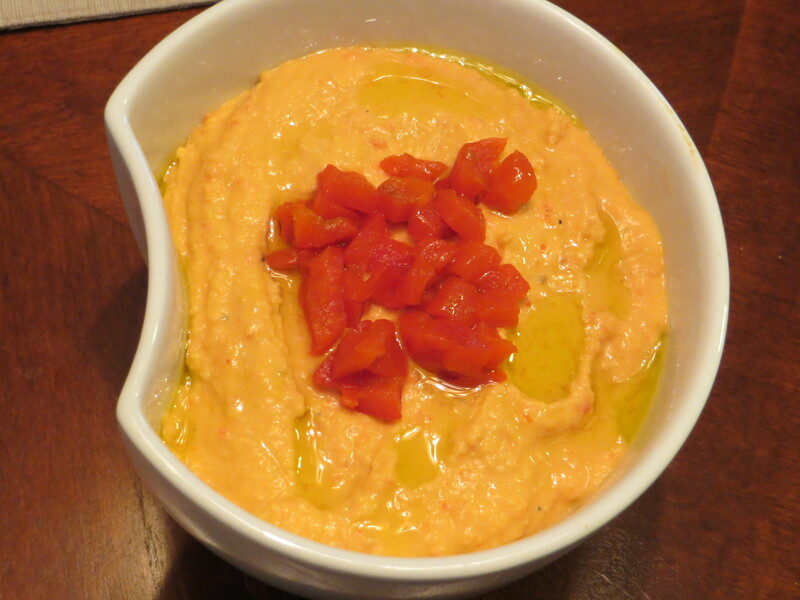 Back in April, I tried out Ellie’s Roasted Red Pepper Hummus to delicious results. Hummus has long been a favorite, but until Ellie’s recipe, I had only ever tried one recipe for it courtesy of WeightWatchers. While the WeightWatchers one is a tasty recipe, it’s also VERY heavy on the garlic in order to make up for the lack of olive oil and tahini. (So heavy, in fact, that I can still taste it hours after eating it.) So I was eager to try Ellie’s take on hummus, which includes both olive oil and tahini in its list of ingredients but in reduced, reasonable quantities compared to a full-fat hummus recipe. The only change I made to the recipe was reducing the amount of fresh lemon juice from 3 TB to 2. I typically dislike recipes with too strong of a lemon presence, so I’ve learned to be careful from the outset when a recipe calls for lemon juice. I found the 2 TB to be perfect for this hummus. John’s look upon seeing the hummus on the table was one of skepticism; even I can admit that the pink-orange hue of roasted red pepper hummus is perhaps slightly unappetizing. Yet he and I both liked the taste of the hummus quite a bit, granting it a solid 4 stars. Even with its higher PointsPlus value, I would make this recipe over my old WeightWatchers one any day. 1. Finely chop 1 tablespoon of the roasted red pepper and reserve for garnish. Coarsely chop the remaining roasted red pepper. 2. Using the broad side of a knife blade, mash together the garlic and the ½ teaspoon salt to form a paste. Place the garlic paste, chickpeas, tahini, lemon juice, 2 tablespoons of the oil, cumin, water, and roasted red pepper into a food processor and process until smooth. Season with additional salt to taste. 3. Place the hummus into a serving bowl and garnish with the reserved red pepper. Drizzle the remaining 1 teaspoon of oil over the top. Hummus will keep for about one week in an airtight container in the refrigerator. Yield: 8 servings (serving size: ¼ cup). Per serving, 4 PointsPlus. For the second year in a row, John and I spent Super Bowl Sunday at my parents’ house, munching away on my dad’s smoked ribs and an array of healthy appetizers that my mom and I prepared. With my dad on WeightWatchers, it was the perfect time to try out four new Ellie Krieger recipes from Comfort Food Fix, my cookbook of the year. Ellie can always be counted on for tasty-yet-good-for-you recipes, so I had no qualms about trying so many new recipes at once. 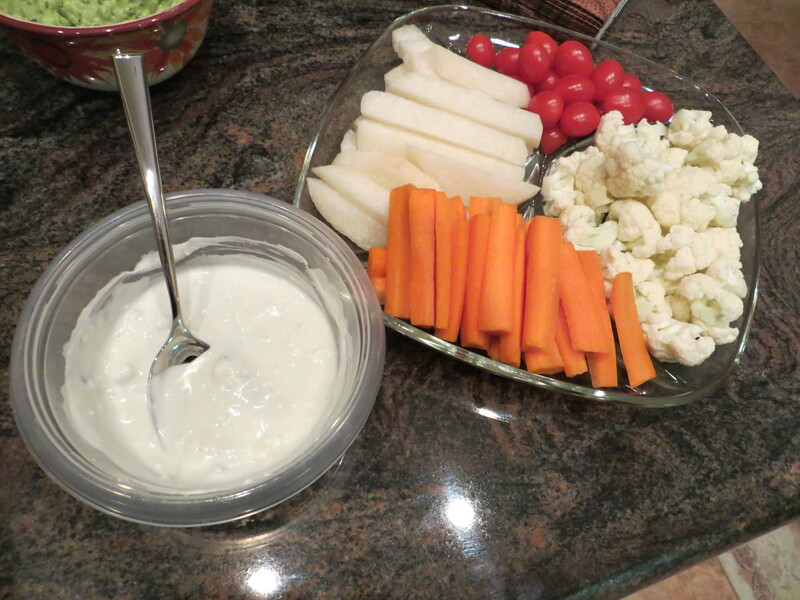 For savory snacking, I selected Ellie’s Triple Onion Dip and Smoked Paprika Potato Chips as well as her Blue Cheese Dip that we served with raw veggies rather than buffalo wings. We rounded out the meal with the ribs, turkey Lit’l Smokies in BBQ sauce, WeightWatchers Jalapeno Poppers (another new recipe that turned out to be a winner), Pioneer Woman Homemade Salsa, and my mom’s homemade guacamole. 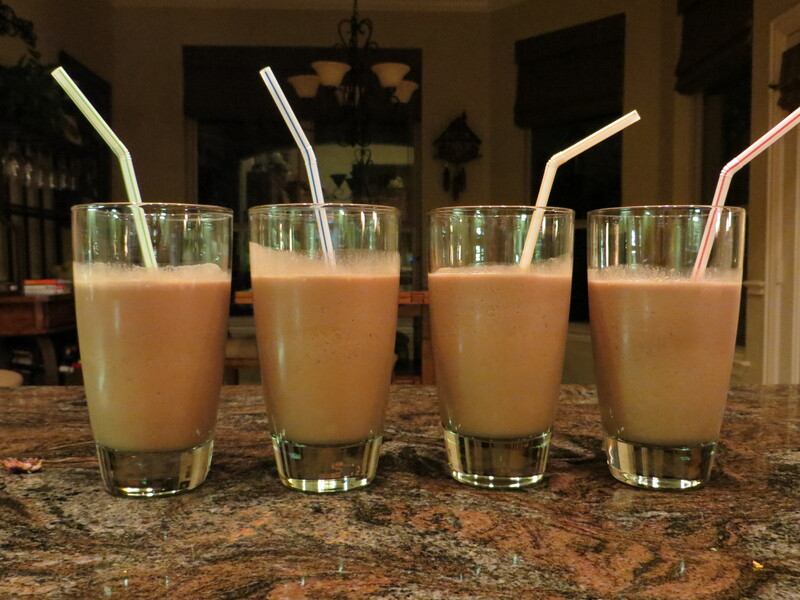 For a sweet finish (and my fourth new Ellie Krieger recipe of the night), my mom and I agreed upon the Double Chocolate Banana Milkshakes from Comfort Food Fix, which would be easy not only to make, but easy to make gluten-free for my mom. I made the two dips at home the day before the big game in order to let the flavors meld. Even before tasting the Triple Onion Dip the following day, I knew as I stirred the ingredients together that it was going to be good based upon its looks and aroma. I found my interest in this dip to be surprising considering that onion dip (almost always made from a package) has never been a big temptation or delight for me. Apparently I just hadn’t had good onion dip because good onion dip calls my name when I am near. I granted the dip 4.5 stars. 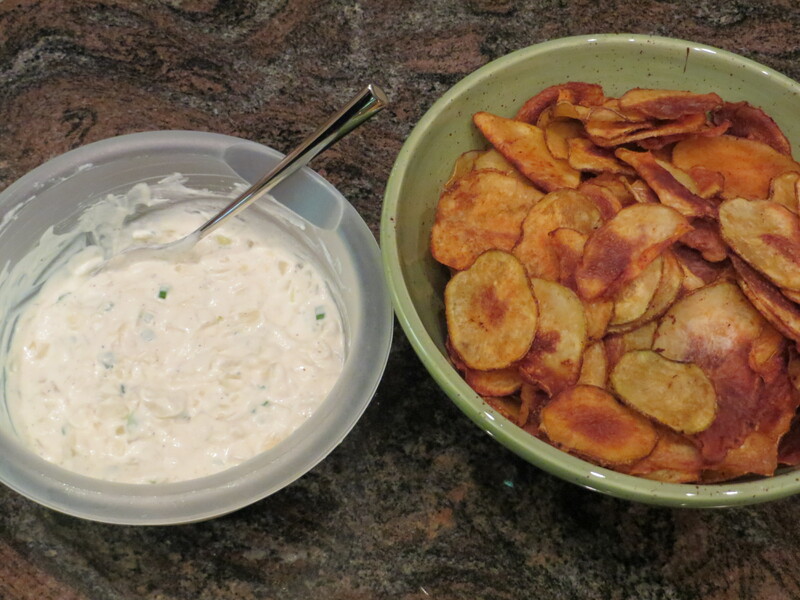 Ellie recommends serving the Triple Onion Dip with her homemade Smoked Paprika Potato Chips, so it seemed inevitable that I would make the chips, too. I ordered a Benriner mandolin slicer expressly for this recipe. I had been wanting one, anyway – this was just a good excuse to go ahead and click “Order Now.” Originally I had intended to make the chips at home the day before, but time got away from me and I didn’t make them until I got to my mom and dad’s on Sunday. I was glad of this in the end, as John and I discovered on Monday that the chips did not stay crispy overnight. The potato chips gave me a little trouble while baking; they would go from underdone to burned and black in a matter of seconds, it seemed. Part of the issue was that I had not evenly sliced all of the potatoes (it took me a little while to get a feel for the slicer), so it was hard to cook them evenly as a result. 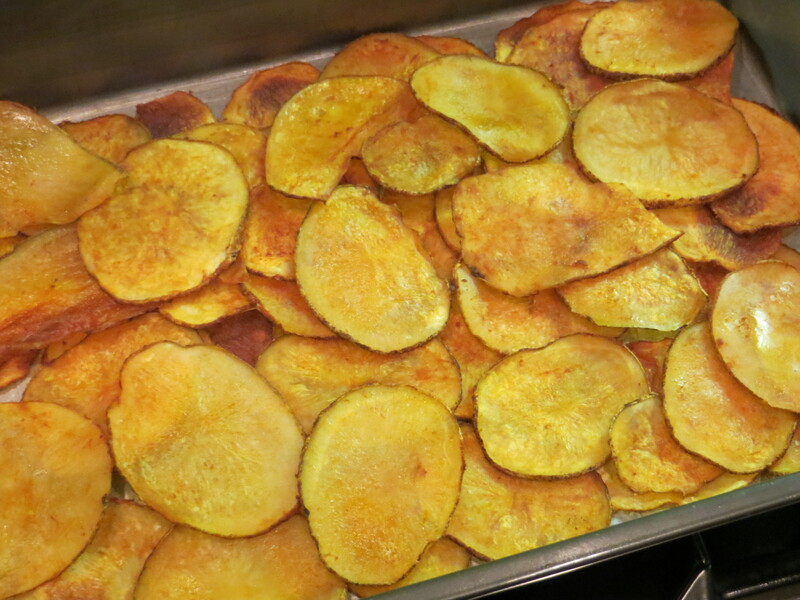 But some of the chips did crisp up as stated in the recipe, and they all tasted delicious. The smoked paprika flavor was the perfect pairing for the Triple Onion Dip, and the four of us ate an embarrassing number of chips. They earned 4 stars from me, with potential for more if I can perfect the baking time. As for the Blue Cheese Dip, I only took a little taste of it as blue cheese is not a favorite of mine. John hates blue cheese, so for the first time ever, he refused to try even a bite of something I had made. My parents are blue cheese fans, however, so they were given free reign over the dip and seemed to enjoy it with the raw veggies. I would give the Blue Cheese Dip 3 stars, but blue cheese fans would likely rate it higher. Finally – the Double Chocolate and Banana Milkshakes. Both my parents and I looked unsuccessfully ahead of time for chocolate frozen yogurt, so we ended up using Blue Bell’s No Sugar Added Lowfat Dutch Chocolate ice cream, which worked perfectly with the unsweetened cocoa powder to make up the “double chocolate” in the recipe’s name. With some cold nonfat milk, frozen ripe banana chunks, and a little ice, we quickly blended up four tall glasses of chocolate-y goodness that only cost 6 PointsPlus apiece. The milkshakes garnered 4 stars despite the “diet” aspects of the recipe’s ingredients. They are a definite make-again! All in all, our Super Bowl party was an unqualified food success. The game may have been a dud, but with such tempting treats before us, we could not have cared less. Before I settled on serving the Whole Roasted Garlic spread alongside my homemade Blooming Herb Bread as an appetizer for a small dinner party John and I hosted last month, I briefly considered making the Hungry Girl’s Caramelized Onion Fillo Bites. Never having made the appetizer recipe before, I whipped up a half-batch of the onion bites the week before the party to help me decide whether they were guest-worthy or not. The onion bites were very easy to prepare and assemble. I had the onion caramelizing on the stove while I was in the kitchen preparing other food for that night’s dinner, so the time factor of caramelizing onion was not of particular concern. John and I taste-tested the onion bites as an appetizer before our dinner, and we both enjoyed them. 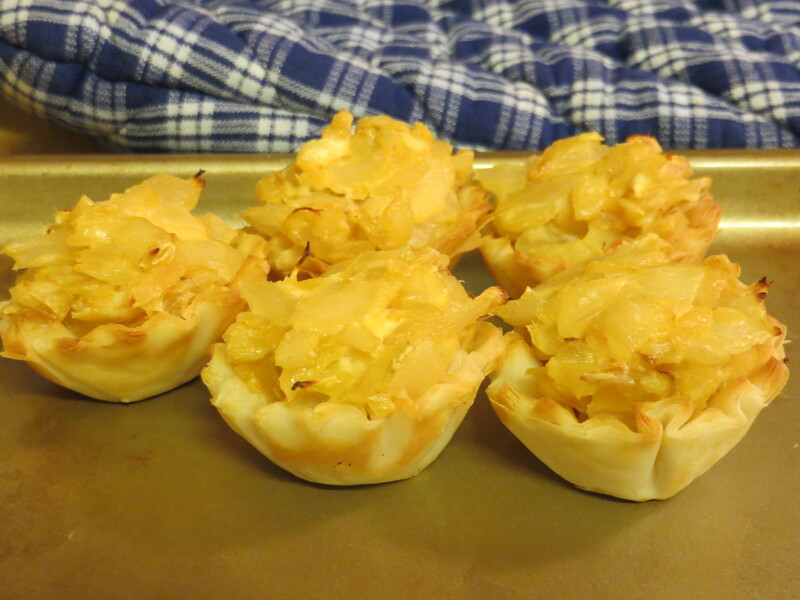 The combination of creamy cheese, sweet onion, and crunchy fillo shell was an enjoyable one. I gave the onion bites a respectable 3 stars, but I decided I would not want to serve them to guests when I was preparing just a single appetizer. I would be more likely to include the onion bites in a party menu in which multiple appetizer choices would be present. 2. Bring a large skillet sprayed with nonstick spray to medium-high heat. Add onion, garlic, salt, and cayenne pepper. Cook and stir until slightly softened, 3 – 5 minutes. 3. Reduce heat to medium low. Stirring frequently to ensure onion doesn’t burn, cook until browned and caramelized, 20 – 25 minutes. 4. Transfer onion to a bowl. Add cheese wedges, breaking them into pieces, and stir until melted and evenly mixed. 5. Place shells on a baking sheet and evenly distribute onion mixture among them. 6. Bake until shells are lightly browned, about 8 minutes. Yield: 2 servings (serving size: 5 fillo bites). Per serving, 5 PointsPlus. When John and I visited my brother, Tom, and his wife, Lisa, in California last summer, they treated us to a homemade dinner upon our arrival at their home. Along with herb bread and an assortment of tasty cheeses for an appetizer, Tom served two heads of whole roasted garlic. Both John and I gobbled up the warm, spreadable garlic cloves, and I vowed then and there that I would try roasting garlic once I got home. Fast-forward four months, and I finally got around to doing it. Spurred on by the occasion of having another couple over for dinner, I went looking through my cookbooks for roasted garlic recipes. 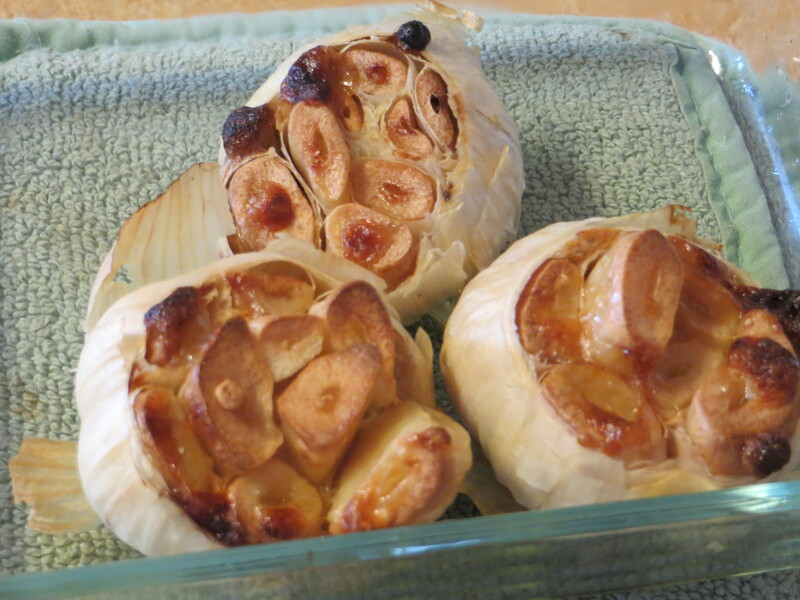 I settled on Ellie Krieger’s Whole Roasted Garlic from The Food You Crave. Simple and straightforward, it seemed the way to go. I tripled the recipe, roasting three heads of garlic instead of just one. After the heads roasted beautifully in the oven, I followed Ellie’s suggestion to mash the cloves and serve them as a spread alongside my homemade Blooming Herb Bread. This was a wise choice, as the garlic spread was not only delicious, but it also saved our guests from having to handle the oil-saturated heads of garlic themselves. All in all, the recipe earned 4 stars. 2. Cut the top third of the garlic head off so that the tops of the cloves are exposed. Place the garlic head, unpeeled, in a small ovenproof dish and drizzle with the oil. Cover with aluminum foil and bake for 30 minutes. 3. Uncover and bake until the garlic is soft and golden brown, another 30 to 40 minutes. If not using immediately, let cool, then store in an airtight container in the refrigerator for up to 5 days. Yield: 4 servings (serving size: 2 tsp mashed or 4 cloves). Per serving, 1 PointsPlus.